Koo Coin Play (KCP) is the world first Instant Global Competition Platform. KCP enables user-vs-user eSports competition via 750+ top-quality instant games across all genres and all devices. KCP cuts the clutter and deliver instant global competitions to your fingers anytime anywhere, plus the extra bonus of you winning real money! As long as you know how to play a game, you can earn supplementary income at KCP! Koo coin is all that you need to play, compete and profit at KCP. You and your opponent (target or randomly-matched) agree on a certain amount of Koo coins first on a chosen game, and you two then play that game and compete in real time. 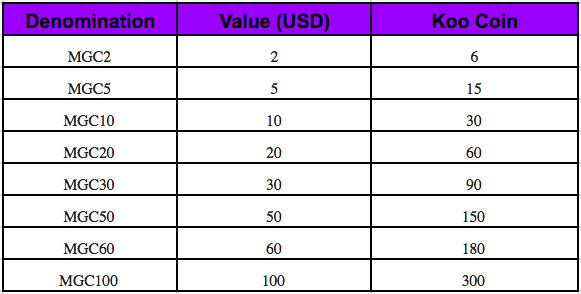 Once the competition is over, the winner will get the Koo coins as profit on top of the exciting real-time game fun! With Koo coins, you can also participate in various exciting tournaments at KCP to win pretty handsome grand prizes as a champion. 2. Enter your Multi Game Card Serial & Pin then click "Redeem".